For millions of Syrian refugees, the question of “home” remains at the forefront of their thoughts. Where is home? Will they ever be able to return to it again? Does the house remain, or has it been destroyed? If it remains, will someone else have moved in? What about the neighbors; will they still be there? And if there is no returning to Syria, can this new country of exile possibly become home? In the wake of these questions, Samer al-Kadri, a Syrian bookstore owner from Hama, has been struggling tirelessly over the last five years to build Arabic language bookstores for Syrian refugees, offering them a space in exile where they might, as he said, still “recognize themselves.” First opening in Istanbul in 2015 and now in a recently inaugurated pop-up bookstore in Amsterdam, Pages bookstores offer Syrian refugees a place where they can read books in Arabic, attend Arabic concerts and lectures, meet up with one another and, for a brief window, find some respite from a new country that can feel relentlessly foreign. The idea behind the bookstore is captured entirely in its simple tagline: Pages Bookstore: It’s Your Home. 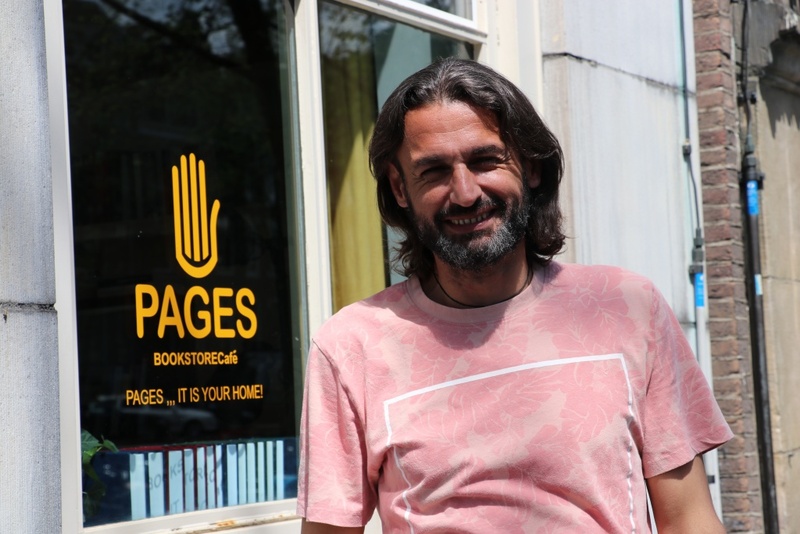 I met up with al-Kadri in Amsterdam in the beginning of June, the day after his latest Pages bookstore opened on the edge of one of the city’s canal to a crowd so large that it spilled out onto the pavement. Pages in Amsterdam is situated on the edge of one of the city’s famous canals. It is hard when speaking to al-Kadri to feel that you aren’t keeping him from something, so relentless is his urge to be productive. Tall and lean, constantly multi-tasking, he is a book publisher, a writer, a bookstore owner, and a working painter. To save money for the bookstore in Amsterdam, located in a gallery loaned by the Prince Claus Fund, he built the bookshelves himself. Born in Hama, he grew up in Damascus and studied visual arts at the Faculty of Fine Arts at Damascus University, training to become a painter. When he graduated, he and his wife, the award-winning artist and writer Gulnar Hajo, worked on developing Spacetoons, the first children’s television programming in Syria. The country had been closed off for decades, with censorship rampant and access to information and cultural materials severely limited. Soon, the couple had two daughters, and searched in vain for good children’s books in Arabic to read to them. Frustrated, the couple soon founded Bright Fingers, a children’s book publisher. Hajo wrote and illustrated many of the books. Al-Kadri’s dream was to educate a new generation of Syria’s children and to ensure that culture was available to everyone, regardless of age or geography. He was constantly coming up with new ideas: for small Arabic cultural centers in the countryside, or for a children’s newspaper. Every request for permission was denied. He and Hajo remained working at Bright Fingers in Damascus through 2011. “Then the revolution started,” he says. “Please don’t call it a war. Call it a revolution.” In 2012 the couple fled from Damascus to Jordan along with their two small daughters, then aged 10 and 5. Each time they contemplated returning, a new outbreak of violence convinced them to stay. In 2013, as the war escalated, they understood that it was not going to end quickly. They would need to start their lives over again somewhere else. The family packed up their meager savings and uprooted to Istanbul, because it was a “beautiful, beautiful city.” They moved into the al-Fatih neighborhood, by then housing so many of Turkey’s more than 3 million refugees that it had been dubbed Little Syria, and found an apartment just next to their children’s school. They borrowed furniture and tried to get by. “It was a hard time,” al-Kadri admits. Aware that the city was now flooded with refugees and that they had no place to meet, in 2015 al-Kadri opened Pages, the first Arabic language bookstore in Istanbul. The bookstore was situated in Fatih, and offered books by Arab authors, foreign language books translated into Arabic, as well as almost nightly cultural events such as poetry readings and musical concerts. It was an immediate success. Syrians gravitated towards books in translation such as Turkish author Elif Șafak and George Orwell, trying to make sense of their current situation. Pages carries both books by Middle Eastern authors and also books from around the world translated into Arabic. I ask him to tell me more about how he founded the bookstore: after all, it couldn’t be easy to show up in an entirely new city and open a bookstore. He disagrees. 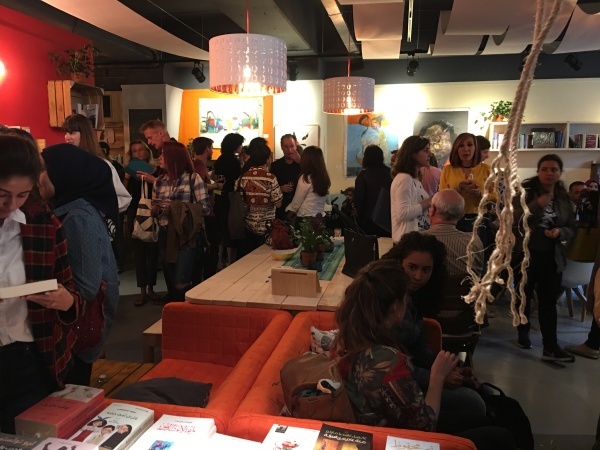 Syrians and locals mingle at the opening night of Pages cafe in Amsterdam. There is a slightly surreal quality to Pages Amsterdam; a feeling of simultaneously standing in two countries at once. Arabic language books are displayed on tables and shelves, with the poetry of Syrian poet Nizar Qabbani and Palestinian Mahmoud Darwish given prominent space, and many of the books of Bright Fingers in a special children’s section in the back. 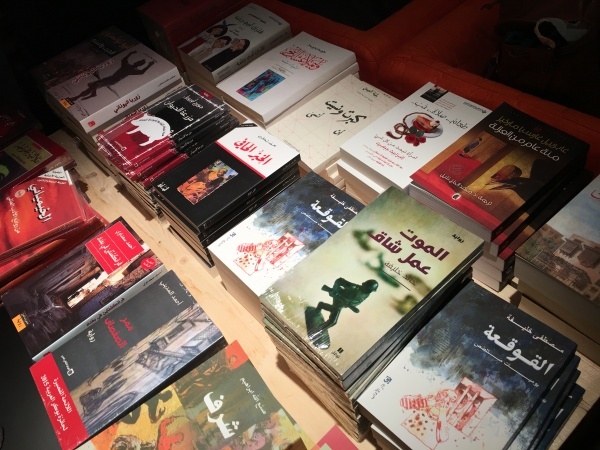 There are also books that would be hard to come by in Syria, such as novels by the celebrated Syrian author Khaled Khalifa, whose novels have been banned. 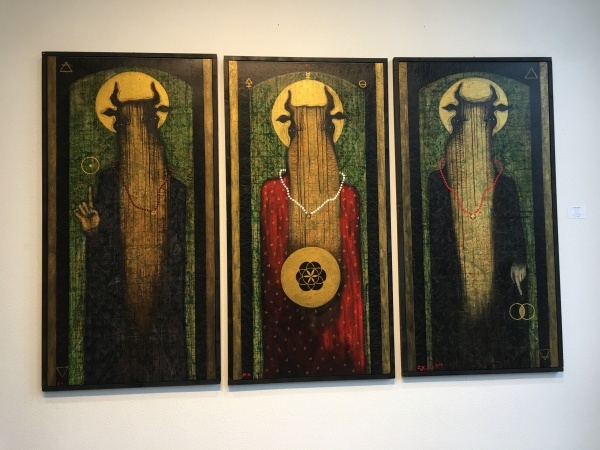 The walls are decorated with an extraordinary collection of paintings by contemporary Syrian artists such as Saif Al-Taie that al-Kadri, himself a painter, curated from Europe and even within Syria. Fairuz, the Lebanese singer, can be heard over the speakers. 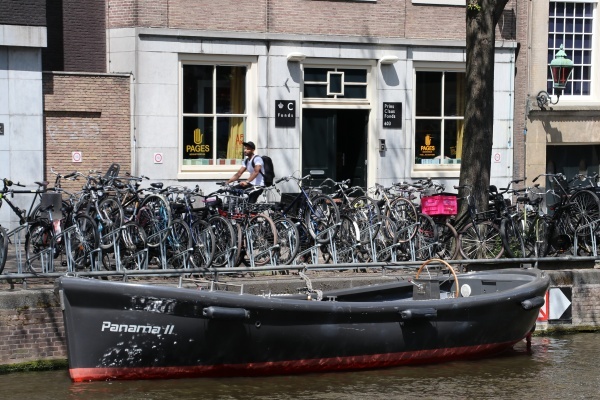 Yet outside the front window, Amsterdam’s famous canal is clearly visible, together with racks of the city’s ubiquitous bicycles. The number of Syrians in the Netherlands rose from 15,000 to 64,000 from the beginning of 2014 to September 2016. But they have few cultural spaces in which to gather. Pages bookstores have allowed visitors a different glimpse of Syrians in exile, one altogether different than the stereotypical image of the refugee. Despite the hardship of exile, Syrian artists are in the midst of a cultural renaissance, with an astonishing number of Syrian visual artists, photographers, film-makers, writers and musicians creating art in Europe. Pages is a place for these artists to show their work. The bookstore is preparing to host an exhibition of Syrian cartoon illustrators, regularly screens films by Syrian filmmakers, holds painting workshops led by Syrian artists, poetry evenings, and musical evenings of Arabic music. A working artist, al-Kadri curates paintings by Syrian artists working around the globe. This is Connection, by Saif Al- Taie, currently living in Belgium. I found mosaicstories today. Thank you again Stephanie for sharing this story of Syria. Your message of hope permeates again! My book group shared A Country Between today. 12 readers were excited to share their reflections.